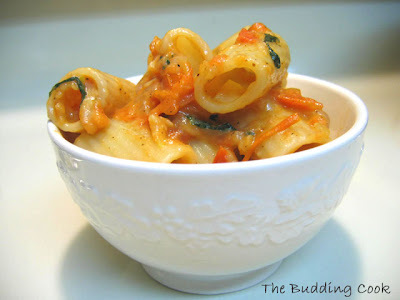 I watched Giada make this pasta dish a few weeks ago on one of my favorite Food Network shows. I was home alone then and terribly hungry, and needed to fix a quick meal for myself. This was just perfect! It was incredibly easy and the recipe called for the simplest of ingredients- tomatoes, basil and mozzarella cheese- ingredients that I almost always have on hand. Bring a pot of salted water to a boil, add the pasta, and cook according to the package instructions or until al dente. Drain well after reserving a cup of the pasta water and return to the pot. In a pan heat the olive oil over medium heat. Add the crushed garlic and shallots and sauté for about 2 minutes. Add the tomatoes, salt and pepper. Cook until the tomatoes are soft. Transfer the tomato sauce to the pot with the pasta. Toss to combine. Add the basil leaves and shredded mozzarella. Mix well. Add the reserved pasta water to thin out the sauce. Serve. It is amazing how these few, simple ingredients come together so well to produce a dish that is bursting with flavors. This recipe is definitely a keeper! Ruth, this simple dish is my contribution to Presto Pasta Night. CAUTION : LOOKING AT MANY FOOD BLOG IN THE EARLY MORNING CAN BE DANGEROUS FOR YOUR HUNGRY STOMACH :)) . that pic is enough to make anyone feel so.... :( . Mmm. pasta looks so delicious. The picture is very tempting. Very simple indeed. Nothing is as satisfying as a home cooked meal, especially when hungry. I make a similar pasta dish and its really easy when you want a quick meal - the shallots sound like a great idea! Sometimes simple is all we need - what a delicious dish! It looks delicious! I always search for these kinda recipes, which are quick to prepare and good to eat. Thnx for sharing! Excellent click, pasta looks great. M also big fan of Gaida, love her recipes, the most glamourous chef huhhhh. really nice and simple recipe.even i watch giadas show and i too have posted a dish from her show.chk it on this link. I like the simplicity. It's easy, and very little can go wrong. Pasta is so versatile. This looks yummy. TBC, wow..thanks for sharing this simple n yum recipe shall post my comment on taste once I make this! Pooja- you are too sweet! I love her recipes. Most of them are so simple. Do let me know how you like it.I liked it so much that I've made it a few times since then. Ranji- I checked your baked penne. It sounds wonderful. I think I remember that episode. Kalai- thank you. :-) There's something about tomatoes, basil and mozarella which makes eating this a delightful experience. Raaga- It is perfect when u need a no-fuss meal and have to cook only for yourself. Grace- welcome to my blog! Thank you for stopping by. In my book Giada always gets it right. ;-)I love her vegetarian recipes. They're all so doable! When are we going to see a post, huh? Those are all ingredients I have on hand. Gonna try this tomorrow...Thanks! A lovely picture of an elegant pasta dish! I think sometimes the best dishes are the simple ones. I love your photo it looks very nice! basil, tomatoes and mozzarella, you can't go wrong with that combination... :) Looks lovely TBC! I'm inspired... I'll make some pasta this week. Chuck- welcome to my blog. I like to keep it simple too. Seriously, how do u find the time to blog and blog hop now? Cynthia- Please do. What did u have in mind? Sukanya- thanks. :) It is a classic combination of Italian flavors. If I had everything on hand right now, I would make it for dinner! There is everything right about tomato-garlic-tomato combo!! Simple yet so comforting! I agree...simple ingredients sometimes produce the tastiest of meals. That picture is superb. Making me hungry!! Great job. Thanks for sharing. I would love this dish. This picture... is stunning, really, I find it so hard to shoot pasta... and you got it with so much style. Congratulations! I think the white color of the bowl has a lot to do with it. It does help bring out the colors in the dish. A simple pasta dish is just what I enjoy, especially with the coming growing season and the availability of fresh produce. Sometimes simple is all you need.